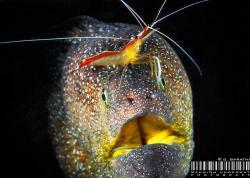 You've been Missing out on Humpbacks, Dolphins, Wrecks and Incredible Macro! Réunion is a French island in the Indian Ocean, about 530 miles east of Madagascar. It is volcanic in origin and one of the volcanoes is actually still active, and known as the “Piton de la Fournaise". The volcano is a major tourist attraction and is located within the Réunion National Park, which is a UNESCO World Heritage site. Réunion Island is young, meaning the lagoons are small and not very deep. But what the lagoons lack is made up for in the open ocean. Since the island rises out of deep water, it’s a magnet for whales and boasts healthy reefs teeming with colorful fish. The water temperature varies from 23 C (73 F) in winter to 30 C (86 F) in summer. Above the surface, Réunon is covered in steep mountains, and as a result, is known worldwide for its hiking trails. The locals are laid-back and welcoming. Getting to Réunion is easy – there are daily flights from Paris, which take about 11 hours. A stunning Indian Ocean sunset from Réunion. 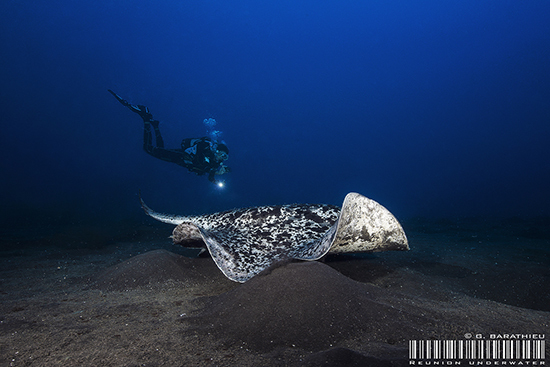 Réunion is a great dive destination year-round! 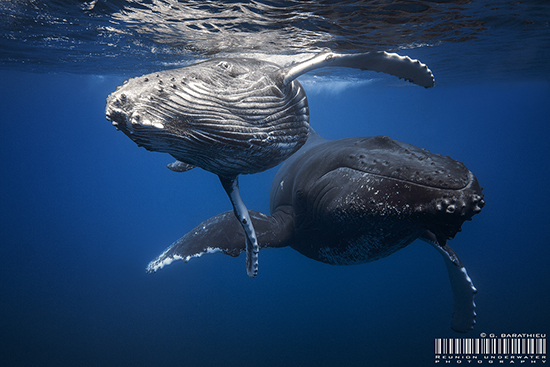 But if you want to see humpback whales, winter is the best season (June to October). Every year, the humpbacks come to breed and give birth near our shores, with the most action happening from mid-August to mid-September. Dive conditions are generally better during the summer, with the highest visibility and warmest water... but it's the rainy season so there are some rough days. 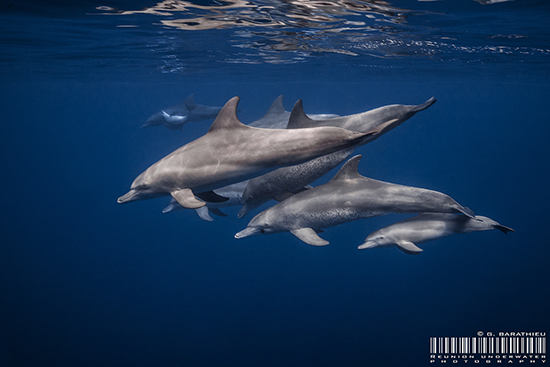 That said, visibility is very good 80% of the year and dolphins can be found around the island all year. A sea turtle flies by. A pod of dolphins plays just outside the barrier reef. Why Should You Dive Here? 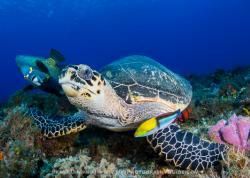 1) Because Réunion is relatively unknown in the diving community, even though it's home to so much marine life and relatively easy to reach (especially for Europeans). 2) Because in the morning you can swim with whales or dolphins and in the afternoon you can shoot nudibranchs and other macro subjects and then enjoy a cocktail on the beach during sunset. Moving in close to a ray. 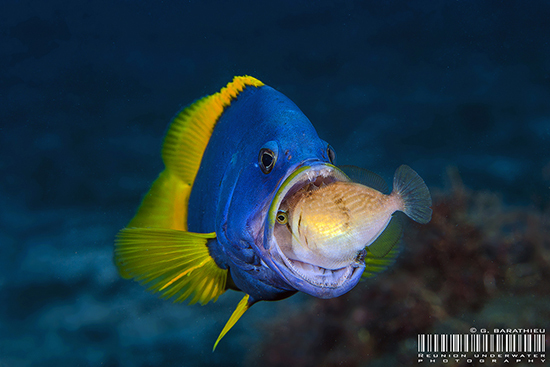 Réunion offers a wide variety of dive sites. Just beyond the reef there are large flats, beautiful steep walls and shipwrecks. Photographers will tend to shoot wide-angle in the morning because conditions are calmer. In the afternoon, macro and the shallower dive sites will delight you with their wealth of corals, sponges, reef fish and critters. 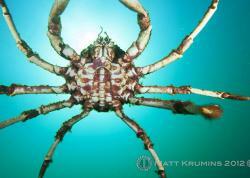 This is a great opportunity to work on ambient light underwater photography. 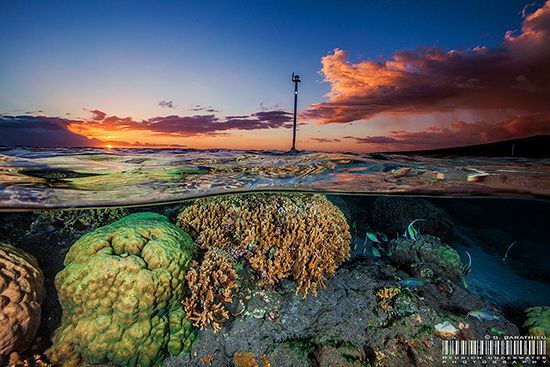 The greatest coral and marine life biodiversity is found on the west coast. There are also lava flows on the south side of the island, which are visited by some dive centers. These sites are exposed to current, however, and for experienced divers only. We also have some wreck diving at Réunion. 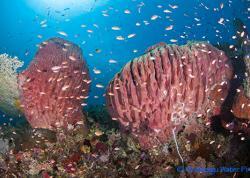 The most famous is the Hai Siang at 55m deep (181ft). When the ship sunk it landed on its side, but then was righted by a cyclone. It's a very fun dive with a descent straight through the blue water column. Photographers can set up wide-angle or possibly ultra wide-angle (14mm). 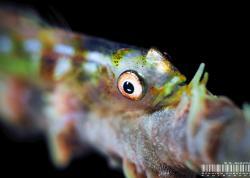 The macro diving is world-class at Réunion Island, with a wide range of biodiversity. The dive sites are usually found on the outer slopes of the barrier coral reefs, but you can also find some extraordinary encounters in the lagoons. Harlequin shrimp are observed in lagoon by free divers, so it’s certain that scuba divers can find them. There are also many colorful nudibranchs waiting to be found and photographed. The wreck diving in Réunion is world-class. A beautiful photo of a deadly scene. 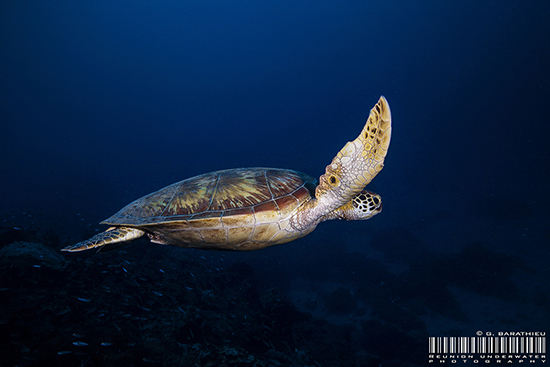 Réunion offers a wide variety of diving mixed with stunning topside landscapes. 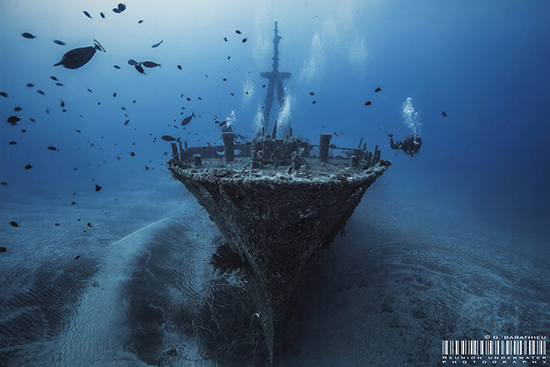 This small French island should be on every underwater photographer's destination list! Interested in travel to Reunion Island? Bluewater Travel can help you book the perfect dive experience. 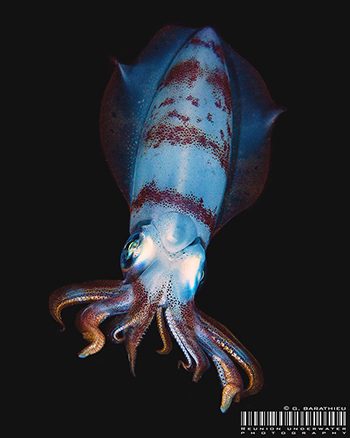 Squid will always entertain underwater photographers at night. 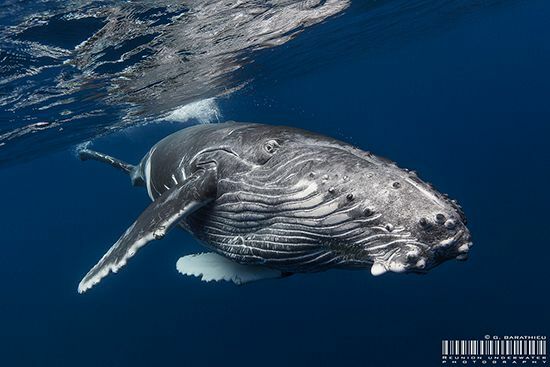 A whale dives after taking a breath.